Screen shot of Michael and Anna Costa's SCREAMIN' cool blog. Jonathan Canlas: be sure to check out his workshop blog. 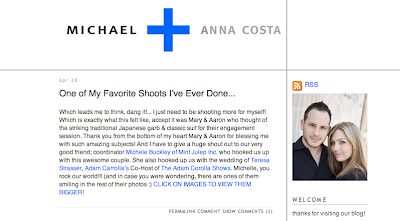 Michael and Anna Costa: don't forget to hit up their forum, Photo For the People| a forum and my full interview with them here. Jasmine Star: don't miss my What's in YOUR Bag: Jasmine Star? Where Jasmine dishes on what gear she carries with her to her shoots. Ed Pingol: be sure to hit up my most recent issue of What's in YOUR Bag: Ed Pingol? I'm going to do my own review on Google's Blogger here on my personal blog later this afternoon, so check back soon. And to all my photog friends who contributed to this article: THANK YOU! May every success, both personal and professional be yours! I came across your blog a couple of weeks ago and I really appreciate all of the information you are willing to share. Please keep it up! It is so helpful for me as I begin my journey to becoming a photographer. That really was a fantastic series on blogging, Natalie. Thanks so much for giving so much of your time and talents! You're amazing! Thanks for the info on Analytics- I've been wondering how you were doing that!